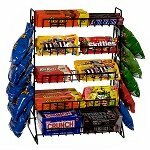 This wonderful Wire Corner Cubby Unit is a perfect choice for an assortment of merchandise. You can place it in the corner of your business not only for sale items but to decorate and lighten up your space. Plants in an office, towels at a small gym, or photo frames in your home; all of these would work wonderfully on this corner rack. 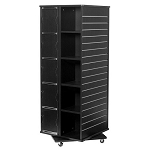 You may also want to purchase separately the rubber mallet for ease in assembling this display shelf.